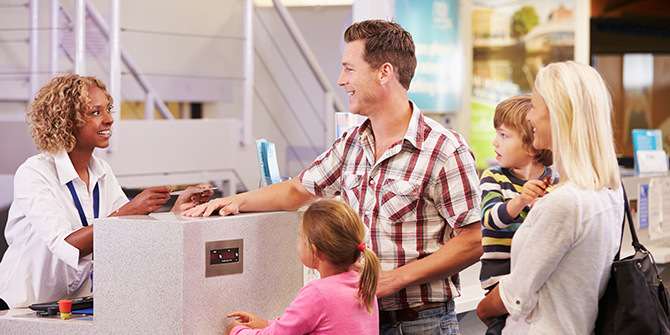 It’s time to review your game plan for using your credit or debit cards while away from home. Cards rank pretty high on the list of the things you hate to lose, somewhere between your kids and your car keys. Ensure your cards stay safe and ready to use while you’re traveling. Before you leave, let your debit or credit card issuer know you will be traveling. Provide your travel timeframe, destination and any places you’re going to stop along the way. This helps card companies monitor transactions for suspicious activity. And they will be less likely to flag your card as stolen when it actually isn’t. If you plan to use your LGFCU Visa® credit card or debit card while traveling, check our travel and safety information for restrictions. Also call the Contact Center at 888.732.8562 for more information you may need before you travel. Make sure you pay attention to the card reader before you swipe your card. Thieves attach devices to card readers to copy your personal information as you complete a transaction. This is called skimming. The devices blend in to the card reader and sometimes go unnoticed, especially if you’re using an unfamiliar one. If something doesn’t seem right about the machine, don’t use it. It’s easy to become distracted when traveling. It only takes a split second for your card to walk away. If you lose your card or it gets stolen, contact the card issuer immediately so they can close the account. You’ll need to provide the last transaction you made so they can check if the card has been used since. If you identify fraudulent activity, follow your card issuer’s procedures to file a claim. Continue to review your statements for a few months after the loss for charges that may come through later or weren’t caught upfront. Never take your eyes off your card. This simple precaution could save you from a lot of headaches later. The advice given is for informational purposes only. Consult your financial advisor for additional guidance.